You always find great talent in every corner of the world as good proverb to represent LINE WEBTOON APK 1.7.4. This app is part of website that publishes ton of comics for free. If you are avid reader in this kind of book, try to install this app and enjoying thousands of interesting story and graphic. Comic grows into popularity since smartphone booming. People do not need to buy book at store to read. On the other side, digital comic gives flexibility for readers, whether they decide to pay for story or subscribe. LINE WEBTOON brings new way for new talents and artists to work independently. After you visit app store, install this app immediately. At first time, reader does not have to register as member. However, developer encourages users to register for more features. You can get your favorite episodes daily or get noticed when creator publishes new work. In this app, people see quality of comic from story, art, graphic, language, words, etc. You just read for free and put rating on what you like the most. Top comics will be presented on homepage. In this app, there is no distinction between amateur or professional. Quality is important part if you want to publish your work. There are a lot of genres in this service. You can see drama, comedy, fantasy, romance, superhero, thriller, mystery, slice of life, and many more. Each of genres have its own rating and top stories. If you want more specific, there is filters to help readers find what they want and follow up regularly. This service offers many languages to attract more reader and artists around the world. You can change language preference to match with contents or keep reading on English version. This app is really amazing and useful to share excellent work. 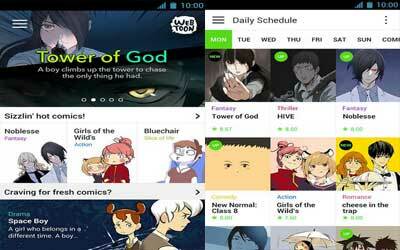 Therefore, you can enjoy read in LINE WEBTOON for android anytime and anywhere. Scheduled publishing: Seven(7) to ten(10) webtoons are serially-updated every day of the week. Language option: The content is offered in five(5) language options, English, Chinese (traditional, simplified), Thai and Indonesian. Minimal data use: You can download webtoons to read them later offline (without an internet connection).